Recently I was driving down a busy street in Dallas, and while stopped at a traffic light, I happened to gaze up to see this sign - Milton St.! I could not believe my eyes; I had found a street named after my boy. Me even observing a street name is rather odd because I am quite unobservant, so of course, I had to snap a quick photo of it! Lately I have grown a bit more curious about the name, Milton, beyond just good, old Milton Friedman. My interest was recently sparked by a writing assignment that I gave my 7th graders to research their first, middle, and last name. This assignment has been heavy on my mind as I am currently working on grading all 94 of those papers. Yes, you heard me right - 94. Oh boy. As you can see, Milton really began to tank in popularity after the year 1880. Too bad. We are attempting to bring it back! 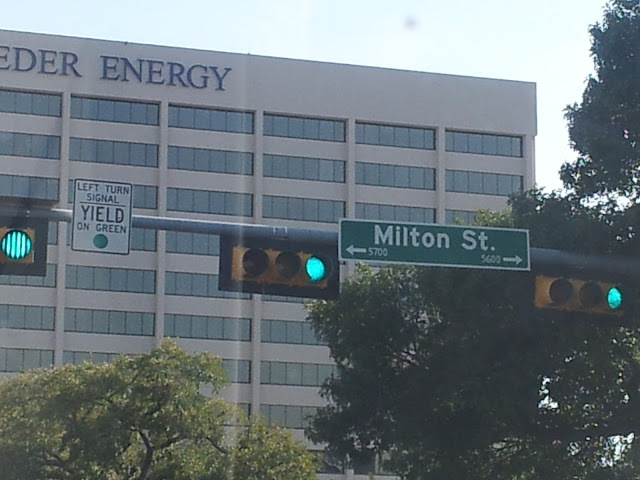 The awesome thing about the name "Milton" is it can pass for either a first or last name. Other popular Miltons include John Milton, a poet, who wrote Paradise Lost, Milton Bradly game company, and Milton Berle, an American comedian. That's all I've got, folks. I will note that whenever we tell people Milton's name, they are quite amused by it. We think the Milt is living up to his name just fine. Milton Berle, how cool to have the same name as him. Me? I have the same name as a kleptomaniac schizophrenic that Alfred Hitchcock thought would look good on screen. Have fun grading papers; I have to tell you that I’ve always been interested in the etymology and history of names. Very cool assignment for the kids!